Finding a baby scorpion in the house means there are probably more… Female scorpions give birth to a brood of baby scorpions called “scorplings” who ride on mom’s back for a couple weeks. 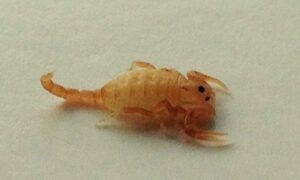 After a couple weeks, baby scorpions go through their first molt. After their first molt baby scorpions can hunt on their own and leave mom to fend for themselves. As you can see from the picture, scorplings are a light creamy color and look just like a scorpion but much smaller. Scorplings can sting and pose the same threats as a mature scorpion. Baby scorpions are a little harder to spot than large scorpions because they’re so small and such a light color. But if you find one inside, keep your eye out for more and set up scorpion control right away. Because scorpions give birth to a brood or scorplings at the same time, If you find one baby scorpion in your home, there are probably more. There is a myth going around about baby scorpions being like rattle snakes that are not true. The Myth is that baby scorpions, like baby rattle snakes, can’t control the amount of venom they inject and so they inject more. If this were true it would make baby scorpions more dangerous than adults… But it’s not true. Baby scorpion stings pose the same risks as adult scorpions. Finding a baby scorpion inside your home is a sign of a bigger infestation, and means it’s time for scorpion control! Don’t risk getting stung. Effective scorpion control starts with an initial clean out using specialized products that are formulated to kill scorpions despite their tough exoskeletons and survival skills. Specialized scorpion control products most be applied in cracks and crevices that scorpions like to shelter in around your home and yard. The best scorpion control is achieved with monthly scorpion and pest control applications because these treatments do not wear off between services! Scorpions inside your home aren’t just gross, they can also be dangerous. Scorpion sting symptoms depend on the scorpion species and the persons response to the venom. People with allergic reactions will have more severe symptoms. Don’t live with scorpions another day… Call, text or email us to set up your initial clean out and monthly scorpion control maintenance today! Providing EFFECITVE Scorpion Control in Mesa, Phoenix, Chandler, Glendale, Gilbert, Scottsdale, Queen Creek, Maricopa, & surrounding areas.